Lauren Werthman struggles with guilt and depression. Even moving to another state and into a new home doesn't help her overcome the life-altering aftermath of losing her sister. Memories of the tragic accident reverberate through her life as her family tries to cope, but Lauren's life spirals out of control. Her mother criticizes her choices every day, her father continues to work later and later, and people at her new school seem to know the family secret. Lauren binge-eats, has nightmares, and doubts the existence of a God Who didn't intervene to prevent the senseless tragedy. As Lauren's family and friends work through the pain and guilt, will they find that even though the void will always remain, the power of forgiveness brings peace and hope and a bright future, or will Lauren forever be lost to the pain and guilt? The first night in our new house, my mother watched every sporkful of food I lifted to my mouth. This was her new mission: controlling my diet. Make that: controlling my life. I had gained some weight since the accident. OK, I was fat. Blimp status fat. But my mother had appointed herself the food warden, and I hadn’t even advertised the position. We sat on boxes labeled “kitchen,” printed with black marker in my mother’s neat handwriting. We’d scooted them next to our rickety card table because our furniture hadn’t arrived yet, even though the moving company promised it’d be here by now. The kitchen was smaller than our old one. The whole house was smaller. But so was our family. Yes, if I had a stomach the size of a gerbil’s. I dropped the chicken and snatched a carrot stick instead. Vegetables were acceptable. I could eat all the veggies I wanted, as long as I didn’t dip them in anything that tasted good, like ranch dressing. Dad cleared his throat and shook his head, barely enough to notice, but Mom caught it. She crumpled her napkin and flung it on her Styrofoam plate, then pushed her “fragile, handle with care” seat away from the table, folded the flaps in on the Crispy Chicken box, and shoved it out of sight in the refrigerator abandoned by the previous owners. I’d bet a hundred dollars Mom had counted the remaining pieces of chicken, so a middle-of-the-night raid was out. This was how she talked to him now, “tell your father,” like I was the interpreter. It had been like this ever since Dad decided we were moving. He said it would be the best thing for all of us. We needed to start over in a new place, so we could move forward with our lives. Before we left Minnesota, we’d crammed everything we could into the back of Dad’s pick-up truck. “Be out in a second to help you,” Dad said. I pushed through the back door and meandered to the truck. Yanking the tailgate open, I stared at the ten-plus plastic bags and the tape-sealed boxes. The wind caught my hair and it whipped around my face. Mom had tagged the twist-tied sacks, and I shoved two marked “bedding” toward the tailgate. The sacks were extra-capacity size and incredibly heavy. “Toss them down to me,” Dad said. “We’d better hurry, looks like a storm’s coming.” Black clouds hovered overhead. The temperature had dropped since we’d arrived, and a cool breeze carried the scent of rain. Dad bent over and grabbed the sacks. For the zillionth time, I saw the rose tattoo on his upper arm with three names on it: “Lydia, Lauren, Haley,” but I turned away, because seeing Haley’s name hurt too much. He carried those sacks inside and Mom plodded over to take the next ones. My parents hauled, and I kept shoving our belongings to the end of the truck bed. “Be careful with that!” My mother handed off her box to Dad. 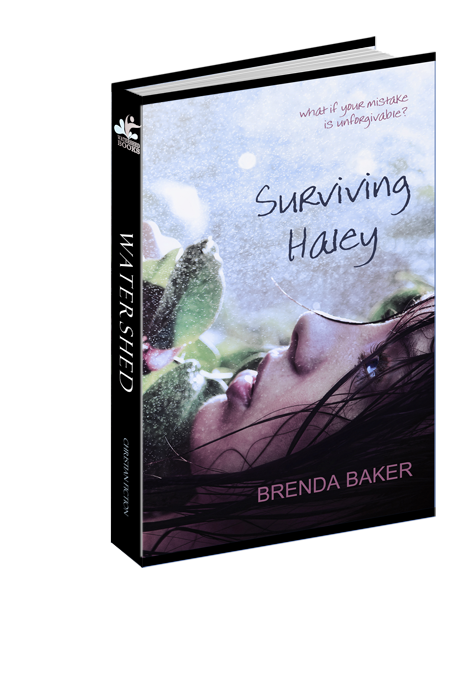 She dropped to her hands and knees and slid Haley’s box close to herself. It was pouring now, the rain drenching our hair and clothes, but Mom slumped against the house, cradling the box and blocking the doorway so we couldn’t get past her. Dad set down his load and lay a hand on her back. She pushed him away without even looking at him. Without a word, she rose and gathered the box in her arms. Dad opened the door for her and she shuffled through it. Dad and I crossed the threshold, our sandals wet, our cargo soggy and damp smelling. Puddles collected around our feet on the tiled entryway. Upstairs, a door closed, and I knew we wouldn’t see Mom for the rest of the night. How much time? It had already been a month since the accident. I chewed my thumbnail down to a stub. I needed chocolate and I needed it now. Something gooey. Knowing my mother, she’d pitched everything remotely sweet, but she didn’t know about the crunch bars I’d bought at the Gas ‘N’ Go and hidden in my purse. He loved me, yeah. But Mom, well, I’d changed her life forever. For Mom, there was no magic left…no more Santa Claus or Tooth Fairy or Easter Bunny. Without Haley, she couldn’t buy toys or play at the park or watch cartoons or animated movies, because she had no reason to anymore. I ripped open a garbage bag, thankful our bedding and towels were dry, and headed upstairs. A narrow line of light glowed under the master bedroom door. No sound came from the room. Was Mom sitting in there on the floor, hugging Haley’s box? After showering, I trudged to my room across the hallway, closed my door, and spread a blanket on the floor before I dumped out the contents of my purse. A cellphone, a coin purse, sticky notes where I’d scribbled down reminders to myself, a billfold with a meager amount of cash, and of course what I was really searching for: a crunch bar. In less than thirty seconds, I’d devoured a whole bar, swallowing the creamy rich chocolate, the taste lingering on my tongue. I had four more, but I couldn’t afford to eat them all tonight. They were my insurance for the next week or so until I had a chance to buy more. For several minutes, I felt better. Good, almost. But it didn’t last. It never lasted. Gathering my stuff into a pile, I shoved it back inside my purse and collapsed against the blanket. The new carpet smell made my eyes water. This was usually a good smell, but not when it was right next to my nose. The floor pressed into my back, and my stomach bulged above the waistband of my pajamas. Were Mom and Dad in the same room? Doubtful. As far as I knew, they hadn’t slept together since the accident. Outside, rain spit against the windows. Thunder rattled the glass panes. The streetlight blinked off along with every light in our house. Darkness swallowed my room. Welcome to Nebraska. Question 1: Do you think Lauren was responsible for Haley's death? Answer 1: Maybe, but the only way the drowning could have been prevented was if Lauren had watched her every minute. Question 2: Were you surprised to hear how Jonah's dad ended up in a wheelchair? Give your reasons. Answer 2: Yes, because Jonah seemed to have his life together. We didn't know that he had a past he wasn't very proud of until he told Lauren his secret. Question 3: Why was Candra (Miss Gladen) able to help Lauren when none of the other therapists were able to do so? Answer 3: Candra became Lauren's friend first, and Lauren learned to trust her. She didn't push Lauren to deal with Haley's death until Lauren was ready. Question 4: Which do you think is more dangerous, binge eating or binge eating and purging? Answer 4: Both have serious psychological and physical health risks, including stress, depression, suicidal thoughts, obesity, blood pressure abnormalities, diabetes, heart disease and even death. Bulimia--the binge/purge behavior--might be more dangerous, because the ill effects can happen faster. Question 5: How did Jonah help Lauren come to believe there is a God? Answer 5: He prayed and kept reassuring her that God loved her no matter what she'd done. When he shared the story of his dad's accident, Lauren saw he was flawed just like her, and yet he was able to go on with his life because of his dependence on God. She knew then that she needed God too. Question 6: What is the definition of addiction? Lauren's mom became addicted to alcohol. Can you become addicted to food? Answer 6: Addiction is a strong and harmful need to have something or do something. Food can become an addiction if you binge eat. It's harmful because it can lead to obesity which causes a host of serious health issues. Question 7: After Haley died, how did Dad's method of coping differ from Lauren's and her mom's? Answer 7: Lauren's dad believed if they moved away from where the accident happened and just carried on with their lives then they'd all be okay. He thought the passage of time and a new start would heal their loss, but he found out his strategy didn't work for Lauren or her mother. Question 8: Why was Eli bullied? By the end of the story, when he had Jonah, Kavya and Lauren as friends, do you think the bullying lessened or even disappeared? Answer 8: Eli's stuttering, his worn clothing, and his homely physical appearance made him different from the other kids--a prime reason someone is bullied. Yes, when he had some friends, it probably became harder to bully him because he wasn't alone. At this point, the others would most likely target an easier victim. Question 9: What makes girls like Tiffany popular? Is "pretty" a requirement for being a popular girl? Answer 9 Girls who are popular usually have high self-esteem, dress well, are good at something, and they can be either very kind or very mean. They aren't necessarily pretty, but care about their appearance. They act confident, and they are natural leaders that other kids listen to and respect. Question 10: Why do you think Tiffany disliked Lauren from the first day on? Answer 10: Lauren reminded Tiffany of who she used to be--an overweight, unattrative girl, someone who didn't fit the image of "popular." We often dislike things about others that we dislike about ourselves. And for Tiffany, bullying was a sport. She did it to Eli, and she thought it would be easy to pick on Lauren as well.